Motorola MT2090 - Starter Kit Bundle That Includes the PDT and Charge Only Cradle - Wi-Fi (802.11a/b/g), High Density 2D Imager, Bluetooth, Windows CE 5.0, Color Display, Alphanumeric Keypad. Kit includes USB cable, charge only (non-communications) cradle, power supply, and US line cord. Streamline scan-intensive data applications with the Motorola MT2090. 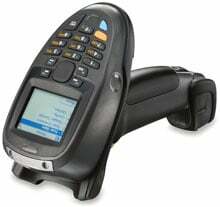 Combining the simplicity of a scanner with the intelligence of a mobile computer, these handheld mobile terminals provide advanced 1D/2D barcode, DPM and image capture, as well as the ability to key in and view data. 802.11a/b/g, Bluetooth, corded and batch connectivity options provide the flexibility to meet a wide range of business needs, and the ergonomic yet rugged design offers comfortable, reliable operation throughout your environment. Built on the .Net platform for easy application development, the MT2090 also comes pre-loaded with inventory software and an MCL client to facilitate porting of legacy applications. The Motorola KT-2090-HD2000C14W is also known as ZEB-KT2090HD2000C14W	or KT2090HD2000C14W	.